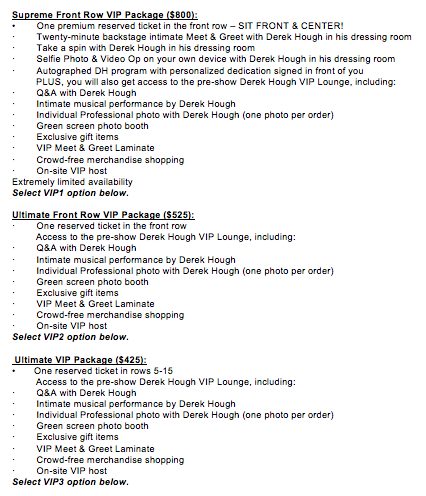 Click here to purchase during the American Express® Card Member sales.From the EMMY® award winning mind of Derek Hough, the live dance show is the first-ever solo tour for the dynamo. The show features brand-new stage production, astounding versatility and, as always, Derek’s magnetic stage presence. Fans will journey through a true fusion of dance and music, as Derek explores styles ranging from ballroom and tap to salsa and hop-hop and everything in between. Creative team and two-time EMMY® winners, Napoleon and Tabitha Dumo, also known as NappyTabs (Jennifer Lopez: All I Have Residency; Michael Jackson: The Immortal World Tour; GRAMMYs® creative direction), will co-create, direct and supervise choreography for the tour.Smoke free. All ages. Wheelchair accessible.Special needs seating call (414) 286-3205.All sales final. No refunds, exchanges or 3rd party pick-up.Regardless of the Method of Delivery selected, all orders with a billing address outside of Wisconsin and Northern Illinois may be held at the box office for pick-up starting 2 hours before the show's start time. A photo ID and the charge card used for the purchase must be presented.THIS TICKET MAY NOT BE RESOLD FOR ABOVE FACE VALUE BY ANY INDIVIDUAL. ANY INDIVIDUAL OR ENTITY RESELLING THIS TICKET FOR ABOVE FACE VALUE BY ANY METHOD, INCLUDING, WITHOUT LIMITATION, IN PERSON, ON AN AUCTION WEBSITE, OR OTHERWISE OVER THE INTERNET, IS SUBJECT TO LEGAL ACTION. ANY TICKET FOUND TO BE OFFERED FOR RESALE ABOVE FACE VALUE WILL BE VOIDED AND SUBJECT TO ADDITIONAL FEES.Any questions? Call the Pabst Box Office: (414) 286-3663.